UVCS/EIT composite image. 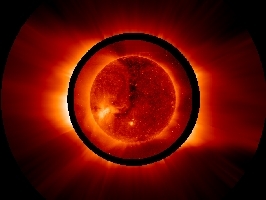 The Sun's outer atmosphere a s it appears in ultraviolet light emitted by electrically charged oxygen flowing away from the Sun to form the solar wind (region outside black circle), and the disk of the Sun in light emitted by electrically charged iron at temperatures n ear two million degrees Celsius (region inside circle). 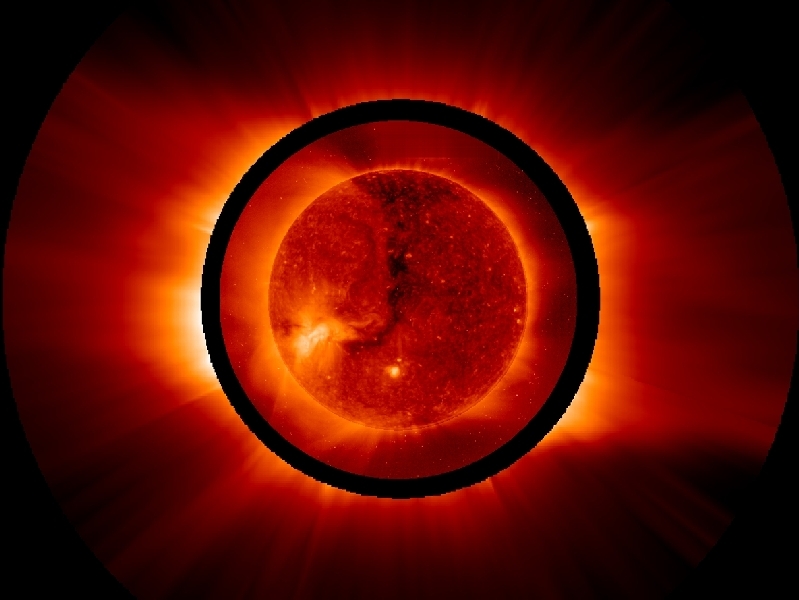 This composite image tak en by two instruments (UVCS, outer region and EIT, inner region) shows dark area s called coronal holes at the poles and across the disk of the Sun where the hig hest speed solar wind originates. UVCS has discovered that the oxygen atoms flow ing out of these regions have extremely high energies corresponding to temperatu res of over 200 million degrees Celsius and accelerate to supersonic outflow vel ocities within 1.5 solar radii of the solar surface. The structure of the corona is controlled by the Sun's magnetic field which forms the bright active regions and the ray-like structures originating in the coronal holes. The composite ima ge allows one to trace these structures from the base of the corona to millions above the solar surface.